A possibility that human body may be affected by ambient light was raised, apparently for the first time, by the Israeli physician Dr. Phillip Cohen in 1970. Since then the circadian rhythm theory (CRT) has received considerable support, from both animal models and human studies. 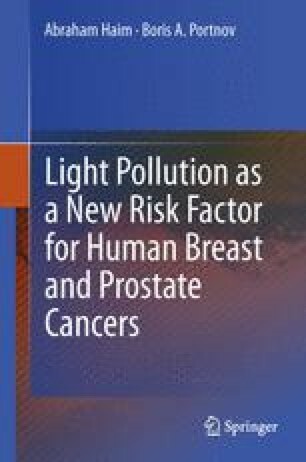 As we know today, the link between artificial light and its potential health effects may be attributed to two interdependent mechanisms—inhibition of melatonin (MLT) secretion from the pineal gland by direct exposure of human vision system to LAN and daily rhythm disruption. Although these effects are discussed in detail in separate chapters of this book, in this chapter, we review, in brief, supporting empirical evidence accumulated to date.